Nicole certainly has a lot on her plate, and apparently, a lot on her bucket list. Not only does she run a non-profit organization, volunteer with her local 4H club, and maintain her home on nearly four acres of land, she is also a loving wife and mother. She does all this with the help of her family and her two service dogs, one retired and one actively working. Nicole overcomes the challenges of living with Epilepsy, Fibromyalgia, and PTSD with a positive attitude and a desire to help others. In 2008, Nicole was looking for an organization that could provide her with a hearing dog to alert her to sounds she was unable to hear due to a Central Auditory Processing Disorder. Most people who require hearing dogs need to be alerted to sounds like the phone ringing, the doorbell, or even a smoke alarm. But, while researching hearing dogs, Nicole stumbled upon Canine Partners for Life and learned about seizure alert dogs. When she started her research, Nicole characterized her seizures as bad but not as common as other symptoms she experienced. But when she found out there were dogs who could alert to an oncoming seizure, she decided to focus on that and learn to adapt to the hearing loss. Not only was CPL close to home for her in PA, it also trained seizure alert dogs rather than seizure response dogs. Nicole felt she would be more relieved to have a dog that could tell her before something happened. When discussing her second experience with CPL and Team Training, Nicole had this to say, “I’m not the same person I was when I got my first dog, but I’m different because of him. I was timid and introverted in my first class. But, Jason prepared me and made me ready for another dog.” Living and working with Jason for five years made Nicole stronger and assured her that when the time came, she could do it again. Jason helped Nicole through so much in those few short years they were a team including medication trials and personal issues at home. Nicole’s second Team Training class was much larger than the first, which would have terrified her had it been the first time around. But, having been through the process and managing a successful partnership with Jason, changed her view and her attitude toward the process. She was a bit nervous about using more mobility aides than she was used to, but she felt much more comfortable after meeting her new classmates. Nicole had fun, contributed to discussions, and made some wonderful friends in her second class. 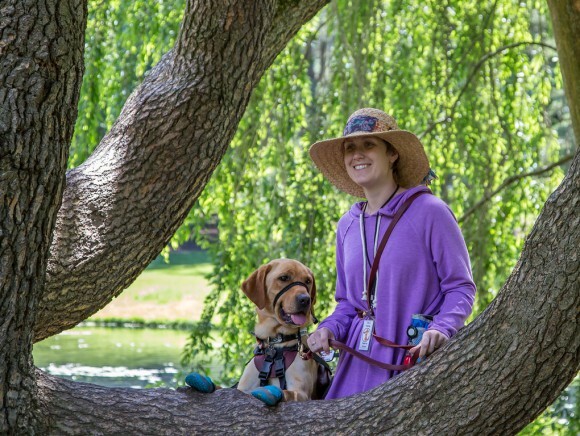 Nicole is incredibly active in her community because of her service dogs. She continues to volunteer with her local 4H club which allows Jason and Cole to make some new friends with the various farm animals they encounter. 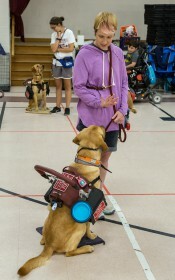 Nicole also does demonstrations each year at the school where her mother teaches so that each new class of students is educated about service dogs, what they can do, and how to behave around them. One of the most amazing things Nicole is doing with her increased independence is running a non-profit organization called Ride to Survive which benefits victims of domestic abuse, both humans and animals. Her organization hosts an annual horse show and auction with proceeds going to non-profits who support domestic violence victims, and Cole is supportive throughout the whole process. “Cole keeps me on my toes all the time,” she says.